Today’s business leaders need communication technologies that empower employees to deliver an outstanding service, and can lead to company growth. Industries such as hospitality and healthcare are looking for cost-effective ways to offer an exceptional in-room communication experience to guests and patients. 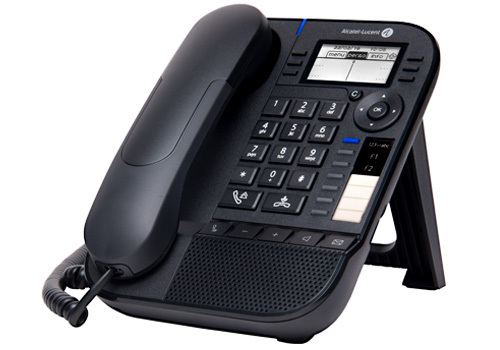 Built on the success and practicality of the Premium DeskPhone line, the new eco-friendly Alcatel-Lucent 8018 DeskPhone offers feature rich IP telephony in a highly optimized format. This entry-level phone offers companies a modern business-grade design with the advanced user-friendly telephony features provided by Alcatel-Lucent Enterprise communications servers. Its three-line screen — combined with application, programmable, and navigation keys — provides outstanding user-friendly communications with fast access to the business’ directory for enhanced efficiency of employees. The 8018 DeskPhone complements the Premium DeskPhone product line targeting the need for essential and enriched 8018 DeskPhone communications. 128×64 back-lit B&W graphical display. Power Over Ethernet Class 1 for low power consumption. Customizable clip and face plates. Modern design enriching the range. Perfect for required and supplemental IP telephony needs. A good-value desk-phone with a complete PBX-feature set. Premium quality, intuitive and compact design. Direct access to a variety of services (i.e., welcome desk, reception, room service, nurse, emergency button, and more). User-friendly, easy-to-use interface with multi-line graphical display. Eco friendly with low power consumption. Display the company, hotel or hospital logo and brand image. Adapted for hotel and hospital bedside tables.